Premier credit restoration company held a school supply drive through July and August. MSI Credit Solutions is pleased to announce their school supply drive for the months of July and August was successful, having gathered over 400 supplies for Friendship House in Garland. Client Services Representative Bianca Carrera coordinated the drive, which included a variety of supplies from backpacks and spiral notebooks to writing utensils and more. 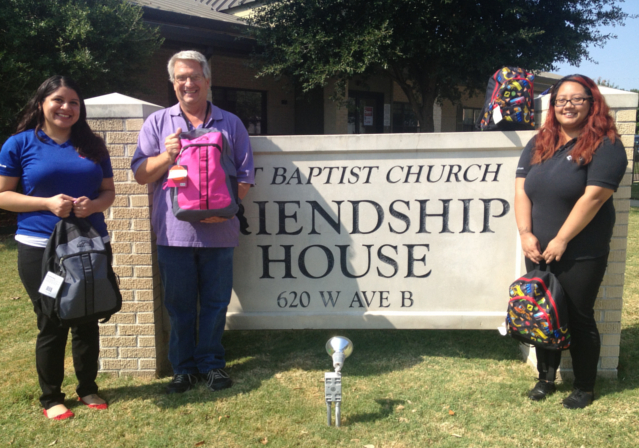 The supplies were donated to Friendship House in Garland, a benevolence ministry sponsored by First Baptist Church of Garland. Friendship House, in conjunction with local churches and community organizations, was organized in 1977 to help meet the physical needs of those who were out of work, physically disabled or low income for a variety of reasons and circumstances. With the help of many volunteers, it reaches out to as many as 175 families per week. Carrera and Jennifer Kuch, a processing representative for MSI, took a tour of the Friendship House facilities and met with its director, Keith Christie. “Keith Christie walked us through the daily operations at Friendship House. This organization is able to provide to those in need thanks to the help of all the volunteers. Working in my department I’ve heard of clients who, because of the economy and their credit issues weren’t even able to afford to feed their family at one point. It’s good to know there are organizations such as Friendship House who help those in need. They are also always welcoming volunteers and I personally look forward to make future donations and volunteer as well,” said Carrera. For more information on MSI Credit Solutions, please visit their website. MSI Credit Solutions provides superior credit restoration and comprehensive consulting services that are reliable and affordable. They embody amicable communication with their clients through each phase of the restoration and rebuilding process. MSI can help clients increase their credit score and develop strategies for credit repair. They pride themselves in catering to each individual’s needs, while simultaneously providing personal attention that each client deserves. For more information and a free credit consultation, please give them a call at (866) 217-9841.